It was during one of my Spey casting and fly fishing schools in New Brunswick that I first heard tale of the Bow River, a ribbon of blue that threads its way from the Rockies north of Banff and heads southwards through Calgary before eventually turning north and draining into Hudson's Bay. I was told that it was an excellent trout river and was invited to visit Calgary to run a Spey casting course. Since then I have fished the Bow River many times and the quality of the fishing never ceases to amaze me. 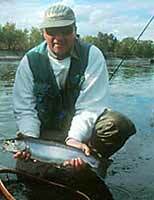 Rainbow trout and brown trout in excess of 20 inches are not uncommon and larger fish are frequently caught. The Bow is a large river and the best fishing is reached by using a boat to drift downstream and reach otherwise inaccessible places. Trout on the Bow are truly catholic in their tastes, streamers, San Juan worms, nymphs, hoppers, hopper droppers and dry flies each have their times. My favourite method is to fish on the surface if conditions are anywhere like suitable and the largest fish come up when the hoppers are about. A good day's fishing on the Bow produces amazing catches, it does not happen like that every day and even on its off days (every river has them!) it is a awesome river. Of course I have always been fortunate enough to have top quality guides from Bow River Troutfitters whose owner Mike Day (himself a brilliant angler) takes great pride in the quality of his guiding and retail operation and I freely admit that much of the tremendous success that I have enjoyed on the Bow and other Alberta rivers has been due to his advice. 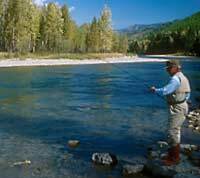 Fly fishing trips to Alberta with accommodation, fishing instruction, fishing on the Bow River and other rivers in the foothills of the Rockies including a full expert guided service can be arranged to suit your requirements. The guide service includes provision of boats, snack meals etc. during the trips. Recommended tackle is a 9 foot #5 travel rod, floating line and a sink tip or sinking line (for streamer fishing) together with a selection of flies that are probably best bought locally. Breathable waders are an advantage but you need not carry them with you because they can be hired locally as can rods etc. if preferred. For information or enquiries about fishing in Alberta please contact me by e-mail or phone +44 (0) 1796 473718. The zero in brackets must be used instead of the international code for calls within UK, it must not be used from international addresses.